... although looking slightly higher in the capital structure reveals ongoing skepticism, with the yield on DB's 6% contingent convertibles rising, and set to hit 10% any moment. However, much to the chagrin of investors in the biggest European lender, the barrage of bad news facing Deutsche Bank is not nearly over, and as the WSJ reports, the sharp drop in DB's stock price could mean the exit from a major European index, jeopardizing its inclusion in the giant funds that track that benchmark, and assuring new all time lows as mutual fund liquidate their holdings. The issue is that DB's share price has dropped by more than 40% this year, as it struggles with falling profitability and other legacies of pre-financial crisis exuberance; the price is so low in fact, it would no longer be included in one of Europe's most important inidices if there were no changes for the next 2 months. 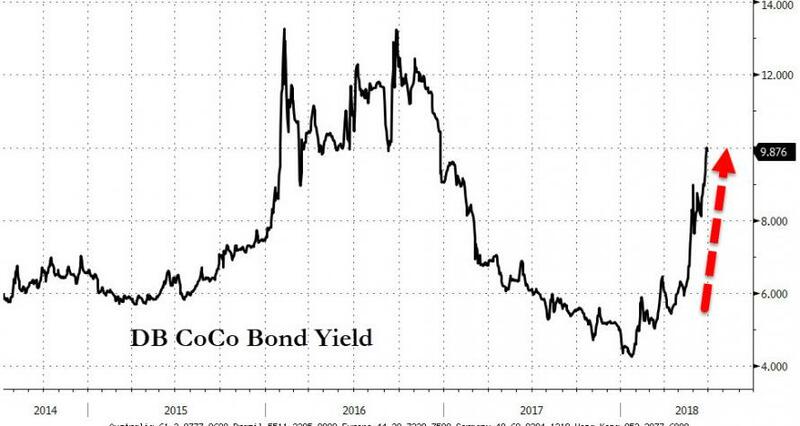 According to WSJ calculations, Deutsche Bank’s market capitalization has fallen to a level that would see it removed from the Euro Stoxx 50, taking the lender out of the orbit of exchange-traded-funds with €42.5 billion ($49.1 billion) in assets that follow this index. 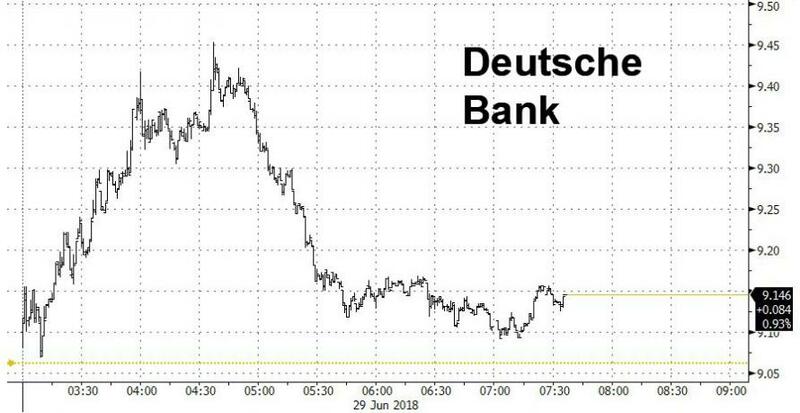 Still, an expulsion from the index is not assured, as a large bout of buying could save Deutsche Bank’s place in the index when it is rejigged in September, "but its presence in the relegation zone is a dramatic indicator of the once-European banking champion’s fall from grace." The most important indexes for Deutsche Bank are the DAX and MSCI, but losing the Euro Stoxx 50 would be unhelpful, the person said. Index provider Stoxx rebalances the Euro Stoxx 50 every September to remove companies whose market capitalization has shrunk below a certain size and to add those which have grown in the intervening year. The index includes the 40 largest stocks drawn from 12 so-called supersectors. The remaining 10 stocks are filled from the stocks ranked 41-60 by floating market capitalization, prioritizing companies already included in the index. At the beginning of June, Deutsche Bank was ranked 62nd in that longlist by Stoxx. Holding that position would see the bank removed from the index. A few weeks later, as of June 29, Deutsche Bank’s free-floating market capitalization left it ranked 63 of the companies on the Euro Stoxx 50 longlist. Its market capitalization is around €2.6 billion below the stock in 60th place, the last company with a chance of inclusion in the index as it currently stands. When companies are dropped by indexes, the funds that track them must begin to sell those stocks and buy shares in the recently-added companies. 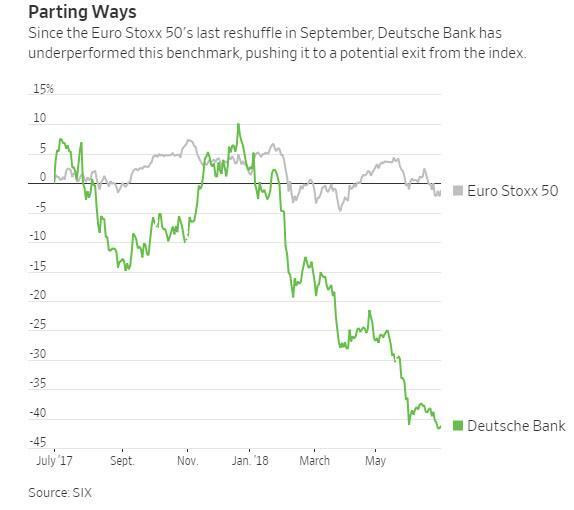 As the WSJ reminds us, this wouldn't be DB's first time on the rodeo: in 2016, Deutsche Bank was removed from a less closely followed index, the Stoxx Europe 50, which also includes stocks from non-eurozone nations like Switzerland and the U.K. But a greater number of funds with more assets under management reference the Euro Stoxx 50, making it more important for companies to be included. Just €2.6 billion track the Stoxx Europe 50, according to Deutsche Börse, which owns STOXX. The impact of being dropped from an index can vary over time, according to some investment experts. “What it does when you exit these indexes is it means Joe Average fund manager no longer has to look at you,” said Dan Davies, a senior research adviser at Frontline Analysts and a former banking analyst. “Having an investor base made up of sector specialists might not be a bad thing, given how often the bank runs into regulatory issues,” he added. The prospect of being expelled from the index is not lost on DB itself, and the WSJ says that the prospect "is on Deutsche Bank’s radar." By the bank’s own estimates, somewhere less than 5% of its outstanding shares would likely be affected by investor rebalancing, in particular by passive investors who would be expected to automatically sell the shares if it fell out the Euro Stoxx 50. However, in this time of pervasive passive dominance and generally illiquid markets, a forced 5% liquidation is more than enough to cripple the stock, especially if it will no longer be buoyed by the tidal ETF wave.